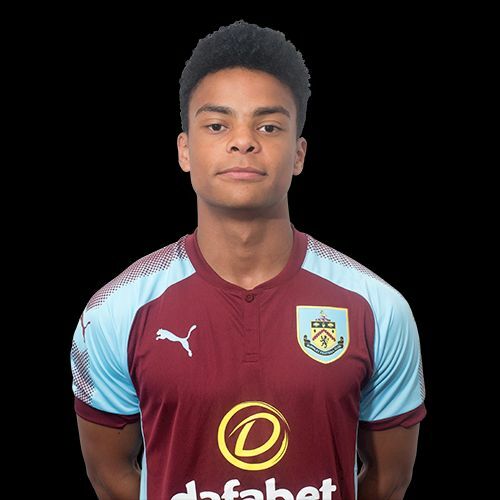 Burnley’s final home game of our first Professional Development League season has ended with a 2-0 win against Coventry at Gawthorpe this afternoon with the Burnley goals coming from Tunde Bayode and Ntumba Massanka. It took us until the 71st minute to get in front but we had been the better side and really should have had the lead before then. We did miss a couple of good chances but there was also the task of beating Coventry goalkeeper Corey Addai. While on loan with Dulwich Hamlet last month, he scored a last minute winning goal but today it was in goal that he stood out and he made some exception saves, two of them from free kicks either side of half time. The one in the first half denied trialist Josh Benson with a superb tip over via the bar and after the break he was at it again, this time getting his hand to a Dwight McNeil free kick. He made another terrific save but was eventually undone by a corner from Bayode (pictured) that went past him and straight into the far corner. At the other end, the experienced Tom Heaton had not had too much to do other than his constant encouragement of the team, but he made one big save to prevent Coventry getting an undeserved equaliser before, in the first minute of stoppage time, Massanka headed home to ensure the points were ours. Then it was a quick check on the Barnsley game. They were winning too and that would have seen us remain a point behind them. But Cardiff scored a goal in the eighth minute of stoppage time to earn a draw and that means we travel to Oakwell this Friday ahead of them by a point. It was a decent performance today with the midfield pairing of Arsenal loanee Benson and Aiden O’Neill an ever growing feature of the game. Generally, we were also defensively sound and going forward the influence of Jon Walters couldn’t be underestimated. Maybe we could, and probably should, have won the game by a bigger margin, but there have been some signs of real improvement over recent weeks that have seen us win five of the last nine games. So, three away games now and hopefully we’ll get the points needed to stay off the bottom of the league and then we can look forward to next season when, given the number of players who have left and the number of trialists who have been on view, it will be a very different looking team. Burnley: Tom Heaton, James Clarke, Teddy Perkins, Oliver Younger, Ali Koiki, Tunde Bayode, Aiden O’Neill, Josh Benson, Dwight McNeil (Mace Goodridge 90), Jon Walters (Tinashe Chakwana 78), Ntumba Massanka. Subs not used: Conor Mitchell, Scott Wilson, Christian N’Guessan. Coventry: Corey Addai, Dion Kelly-Evans, Tom Davies, Dominic Hyam, Jordon Thompson, Callum Maydock, Josh Eccles, Zain Westbrooke (Bilal Sayoud ht), Stuart Beavon (Billy Stedman 8), Kyle Finn, Chris Camwell. Subs not used: Lewis Green, Tom Billson, Reece Ford.